The idea of becoming surety for a stranger, friend or family member has not been spoken highly of in the Bible. We have been warned about the potential dangers and risks involved in doing so. Despite these warnings, there will still be some people who think their situation is unique and choose to vouch for the debt obligation of someone else by cosigning for them. It is unfortunate that they would ignore this wisdom and put themselves at risk for financial and emotional harm. So what do you do if you become surety for someone? Is there a way out if you regret your decision? Well again we turn to the wisest man who ever lived. How do you get out of this debt you have trapped yourself in? The imagery here seems pretty clear. You do it quickly…you don’t delay…you take care of it before you go to sleep that night. 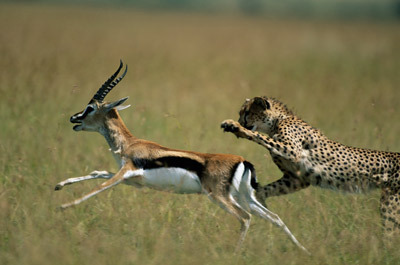 You act like a gazelle trying to flee the hands of its hunter. You run quickly to your friend (or the bank) and plead with him to release you. You should not delay, hoping and praying that the situation will get better and resolve itself without conflict. But did you read between the lines here? Even though you go to your friend and plead with him to release you from your obligation, he is under no obligation to do so. The odds are not in your favor that he will. In fact, he probably won’t even be able to. That will be up to the bank who holds the loan note. Have the borrower refinance and take your name off the loan. This would only be possible if enough time has passed that the borrower’s credit rating has improved to the point the bank will not require a cosigner. Find a replacement cosigner. Good luck with this one trying to explain to someone that you want off the loan but that they should get on it. Convince or force the primary borrower to sell the piece of property you cosigned for. If this happened you could then pay off the loan. This option could potentially end up in court with you paying legal fees to settle the case. Pay off the loan amount yourself and never cosign again. Most likely, this is what you will end up doing. It is clear there is nothing to be gained by becoming surety for someone. There is no upside for you in this type of arrangement. I’m sure I want no part of it. Have you ever gotten out of a loan that you cosigned for? Prior Post: Surety: The Potential Costs of Cosigning a Loan? Thanks Brian for this practical study on surety. Not much out there on the web. I am a pastor doing a study in the book of Proverbs and came across this blog. I must say that I appreciate the way you took this principle from God’s word and applied it to everyday life and relationships, thanks, with your permission, I would like to use a few of your examples of surety. Absolutely…no problem Chad. Glad to know it helped you prepare a message for your congregation.